Building on years of innovation, the Dolphin Escape combines a long list of class-leading features with advanced engineering to create the most capable above ground pool cleaner available. The moment the Dolphin Escape hits the water, you'll know it's a different type of cleaner. Built with energy efficient onboard DC motors for above ground pools, Escape works smarter. Packed with features like microprocessor-control, dual continuous tracks, oversized debris basket, and HyperBrush, it's the most feature-packed above ground pool robot available today. Break away from traditional pool cleaning with the new lowered, sculpted and streamlined Dolphin Escape. Our all-new above ground pool cleaner redefines an industry stuck in the sands of time. We’ve optimized the Dolphin design to deliver unmatched performance in an above-ground cleaner at an unthinkable cost. Don’t settle for a partially clean pool. Dolphin’s award-winning features ensure your pool is deep cleaned and stunningly clear. With popular features including the SmartNav 2.0 and HyperBrush with ultra-fine filtration, the Escape allows you to focus on what’s most important: enjoying pool ownership. Defying all expectations of value-priced pool robots, the Escape features a high-powered HyperBrush to reach a new depth of clean. Spinning twice as fast as traditional pool brushes, even the most stubborn contaminants are dislodged with ease. For most pools, a vacuum isn’t enough to remove algae and other stubborn build-ups attached to the pool wall. Our engineers equipped the Escape with the HyperBrush to deliver a level of clean not available in other above ground pool cleaners. Water between the wheels and pool surface make it difficult for pool robots to maintain traction. Continual slippage results in lost energy efficiency and reduced performance. The Escape takes a radical departure from the conventional wheel with continuous rubber tracks. Escape maintains constant contact even when climbing slippery surfaces. No more slipping. No more wasted energy. The rubber track also improves directional control and provides greater force than wheels. Tracked robots also glide smoothly over obstacles like drains, and are capable of climbing straight up vertical walls. The Escape’s traction is further improved with a high grip, water-optimized tread and geometric shape, which minimizes rolling resistance for superior providing superior weight distribution, traction, and wall climbing. Gone are the days of watching your robot aimlessly wander around your pool. The new Escape is equipped with a SmartNav Robotic Scanning to ensure that every inch of your pool surface is reached. SmartNav software delivers highly optimized scanning and coverage for a new level of clean. With its remarkable pool mapping system, Escape knows where it has and hasn’t been to avoid overlapping cleaning paths and minimize cleaning time. With the ability to sense ladders and drains, Escape won’t get hung up like ordinary cleaners. Microprocessor controlled Pool Scanning ensures complete efficient pool surface coverage. For a complete clean, your pool robot needs a filtration system that can handle debris of all sizes. The Escape is equipped with a massive filter cartridge that can easily be lifted out through the robot’s top-access door. This means those messy and cumbersome debris bags used by traditional pool cleaners are a thing of the past. The Escape’s fine filters fit into the cartridges to capture debris of all sizes, from small contaminants like algae, to large leaves. 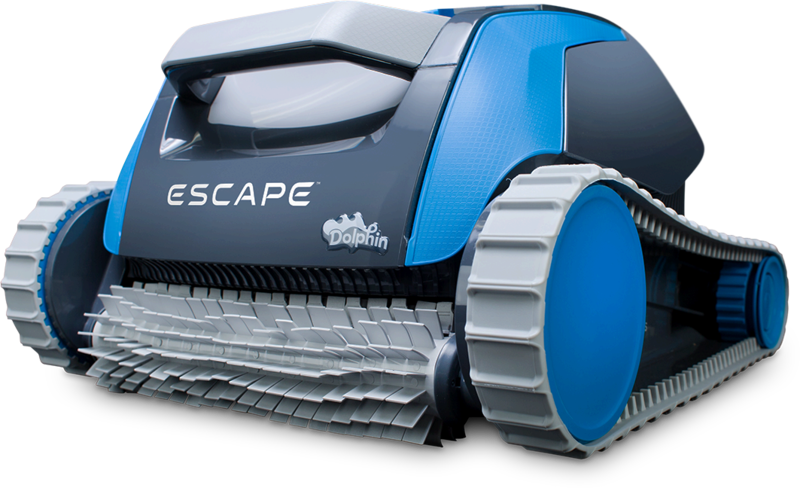 The new Escape will exceed every expectations you have for a value robotic pool cleaner. Revolutionary features and innovative technology come standard, and they’re backed by a full year of warranty coverage. Now’s the time to experience a new kind of clean. Try the Escape in your pool for 30 days, and if you’re not 100% satisfied, just return it. Contact your Escape dealer today and challenge everything you knew about above ground robotic pool cleaners.